Two mas’ men went head-to-head on Saturday night and both came out winners, each in his own way. 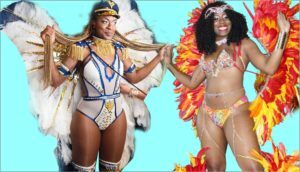 Toronto Raptors celebrity Jamaal Magloire (Toronto Revellers) and Will Morton (Fantazia) took two different approaches in showing off the costumes that members of their bands will be wearing on the road this summer. Toronto Revellers won at the gate but Fantazia had the most social media cameras beaming their pictures to the world. Fantazia was the first band to claim last Saturday’s nighttime slot. But Toronto Revellers also had to launch its band the same night because of the Toronto Raptors’ playing schedule. In addition to running the mas’ camp, Magloire is also the assistant coach of the Toronto Raptors and its player development consultant & community ambassador, and with the club in a playoff drive, April 6 was the only night available to him. reggae / R&B star – Jully Black – on stage modeling mas’ for the first time in her life. With high wings and heels, Black towered over the diminutive guest emcee Akil Augustine (NBA TV Host), sending over 1,000 mas’ fans into a clapping frenzy. Pan Fantasy, Canada’s top steel pan orchestra, was playing in the wings, and the VIP section had a mix of Toronto Raptor’s brass and TV personalities. The theme of the Toronto Revellers band is Treasure Island and models in 15 sections wore pirates and “tropical inspired” outfits. The models were a photographer’s dream; well rehearsed, they made a point of pausing in all directions to give professionals and selfie takers the best shots. If there was any complaint, it was that the event was “too successful.” There were so many people jammed into the hall it was difficult to see the costumes on stage unless you were lucky enough to have ringside VIP tickets. The Toronto Revellers did “live-stream” the show on Instagram, which attracted viewers both from the back of the hall to people at home (and also the media waiting to cover the Fantazia show). Fantazia had originally planned to start its stage show at 12.30 a.m. on Saturday but it began an hour later to accommodate mas’ fans coming from the Toronto Revellers’ show. Fantazia had expected to get 600 people through the door but, even with a post-midnight push, their overall target did not appear to have been reached. However, what made the Fantazia show noteworthy was the set-up of the stage and the model routines. This was one of the most accessible costume launches on record. The big pluses were the sight lines – you got a good close up view of the models, no matter where you stood in the hall and ticket holders were encouraged to stand close-up to the stage. Will and his wife, Lisa, must have realized that personal Facebook postings and Instagram onsite photographs will sell more costumes than live shows. There were no fewer than 200 people taking up-close cell phone photos and videos of the eleven sections which strutted on the catwalk. “ We had 75 models on stage; men and women of all shapes and sizes,” Michelle Brazier, stage manager of the launch, told the Caribbean Camera. In 2009 when Will and Lisa Morton formed Fantazia, they designed all of the costumes. This year almost half of the sections featured their costumes; the rest are lead by longtime members of the band. 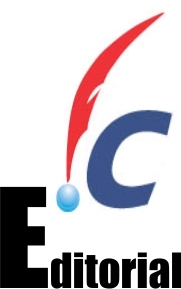 This year Fantasia is celebrating its tenth anniversary and the band is marking this milestone with the theme Rebirth and has adopted a fiery Phoenix as its logo. Many of the costumes were riffs on some of the most popular costumes from years’ gone by. Getting the loudest cheers at the Fantazia launch was one section’s costume designs created by a nine year old girl.